The crowds who came to see Akhay Kumar Mozumdar at this church in 1916 considered him a holy man, possibly even a miracle worker. But was he white? Few today know the story of Mozumdar, or how this Spokane resident became a national test case for the idea of whiteness, one hundred years ago. White Americans of the early 1900s were often obsessed with concepts of race and whiteness. But what did they mean by "white?" In 1912 a recent immigrant from India to Spokane would put the idea to the test. Born in Calcutta in 1880, A. K. Mozumdar was trained in Hindu spirituality from an early age. In 1905 he arrived in Seattle, and found a receptive audience for his teachings, which combined Christianity with Hindu meditative practice. He lectured all over the country, but in Spokane, where he lived and wrote for many years, he was best known for this downtown Christian Yoga Church on 3rd Avenue. But through it all, Mozumdar dreamed of becoming an American citizen. The law at the time offered citizenship only to “free born whites,” but offered no clear-cut legal definition of the term. So in 1912, Mozumdar applied for naturalization, ready to challenge the meaning of "whiteness". 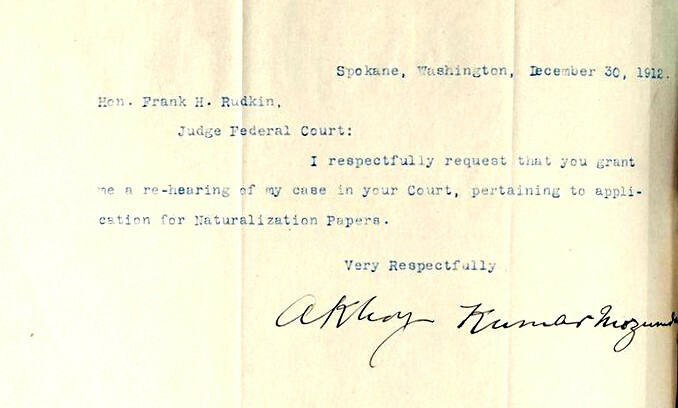 Arguing before judge Frank H. Rudkin in a Spokane courthouse, Mozumdar testified about his ancestry: As a member of the ruling caste in India, he argued, he was of unmixed Aryan blood, and should be considered white under the law. 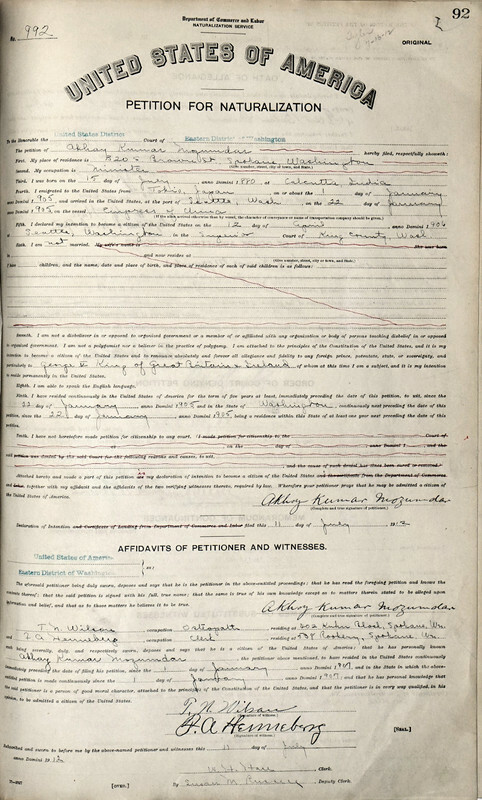 There was no legal precedent for or against him, so as one newspaper account put it, the court had leeway to consider his ancestry “neither white nor black, but shading toward the former.” Judge Rudkin deliberated on the matter for months, but finally issued a judgement in May of 1913. Mozumdar, officially “white” in the eyes of the law, became the first Hindu to become a U.S. citizen. While the precedent did not help Hindus of lower castes or Sikhs, who made up most of the Indians then living in the U.S., it did create a path to citizenship for a number of other Hindus. While in Spokane, Mozumdar wrote his most influential book, The Life and the Way. His Sunday services were popular throughout his time in Spokane, and encouraged a number of other alternative spiritual groups around the country. He also gave lectures about life in India. In 1919 he moved to California, where he continued to grow his church at a new campus in the San Bernardino Mountains. 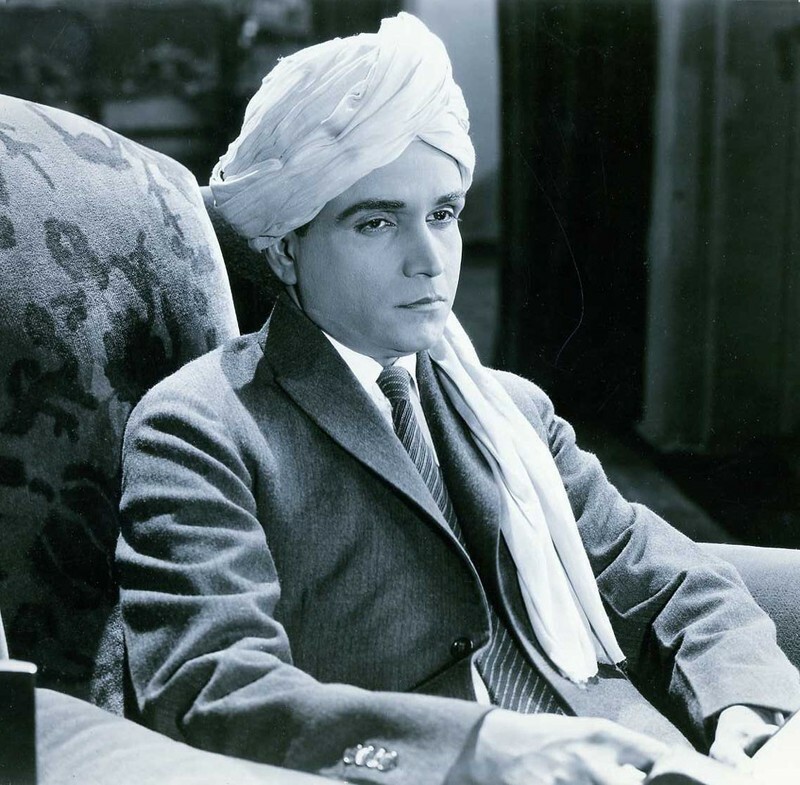 He even traveled to Hollywood to produce a film, "Beyond the Veil," in 1924. When he died in 1953, Mozumdar had spent almost half of his life in the U.S. A 1923 Supreme Court ruling overturned his victory, ruling that Hindus were not “free born whites” after all and stripping him of his citizenship. A 1946 law allowed him to apply again. But these reversals of fortune would not diminish his legacy. Today, Mozumdar is remembered best as a spiritual leader, but he also had a historic role as one of the first Indian-Americans. Charlie Byers, “A.K. Mozumdar and the Problem of Whiteness,” Spokane Historical, accessed April 20, 2019, https://spokanehistorical.org/items/show/618. 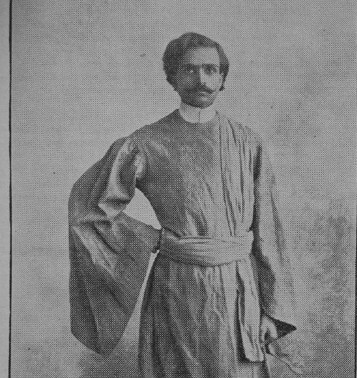 David H. Howard, “Yesterday’s evangelist from India,” The Universal Message, http://www.mozumdar.org/yesterdaysevangelist.html. “Hindu preacher, naturalized here in 1912, now is an alien,” Spokane Daily Chronicle, March 29th, 1924. “India native to citizenship,” Spokane Daily Chronicle, May 4th, 1913. “Mozumdar talks to club members,” Spokane Daily Chronicle, February 25th, 1913. “U.S. rejects philosopher,” Spokesman-Review, December 28th, 1912.